Native focuses on food and being family friendly. 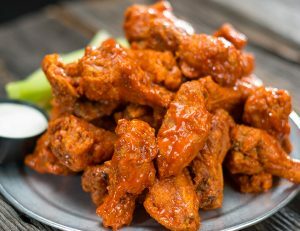 Native Grill & Wings, an award-winning Arizona-based restaurant chain known for introducing chicken wings to the Valley of the Sun is celebrating National Chicken Wing Day on Sunday, July 29. Native will be offering 10-cent wings, with a max of 10 wings per person, as the Native team reintroduces a former fan favorite special from their early days in 1979. Customers can indulge on wings with their choice of over 20 sauces and dry rubs at any of the Native Grill & Wings nationwide. The celebration will give guests, both old and new, the chance to enjoy their favorite wing flavor or try a new one during the one-day limited-time offer. Chicken wings can be seen as the crown jewel in the restaurant industry. They can be dressed in sauces or dry rubs that are spicy, sweet, savory or left plane Jane style and accompanied with dipping sauces galore. Native Grill & Wings (or, “Native,” as the regulars called it) focuses on food and being family-friendly unlike competitors such as Hooters, Twin Peaks and Buffalo Wild Wings. The polished sports grill proudly offers over 20 wing flavors – from Strawberry Hot to Ancho Chile Lime, Asian Garlic to Honey Chipotle – which guests can order by the individual wing, as well as an extensive menu of burgers, sandwiches, salads and more. Most of the sauces and rubs can be used to customize other menu items.